Caterina, an architect from Venice, and Bob, an environmental designer and artist, moved twenty years ago into a typical SoHo “shoe-box” loft, where their studio occupied the front half of the space. Following the arrival of their son, they recently transformed the semi-raw open space with few windows and no storage, into a grown-up luminous residence with flowing common living spaces. The design takes full advantage of the historical vestiges such as the exposed and stained ceiling beams, brick walls, (a demising wall still shows traces of the original warehouse painted advertising), and the found 1970’s carefully restored bathroom, entirely clad in “found” Enzo Mari’s tiles, (in fact, when they demolished the space interior prior to construction, only the tiled walls remained standing). 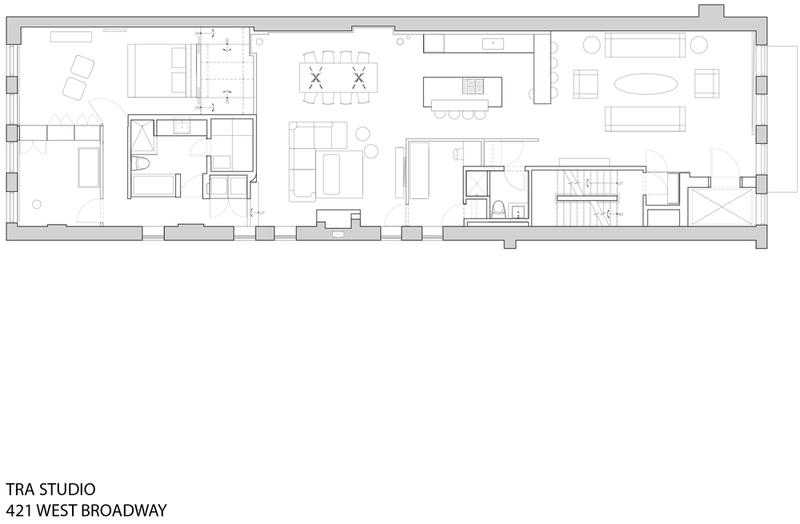 The mostly interior space fortunately had “good bones." A rare light-well was discovered along the building and five new windows could be added; the aluminum sleeves surrounding them, cut into the 2 foot thick masonry wall, reflect and amplify daylight. A new raw steel fireplace enclosure at once conceals and reveals the original utilitarian brick fireplace pit. The living room is furnished with 70’s Knoll credenzas and two symmetrical ten foot long sofas, one being custom designed by Florence Knoll in the 50’s, the other being a rare Poltrona Frau leather unit designed in the 80’s by Massimo Vignelli. The kitchen, a classic Bulthaup, is surrounded by Thonet stools. During their frequent travels to their house in Venice, they assembled a collection of important mid-century Murano glass pieces, mostly from A.V.E.M. The display rotates on the shelves of their dining room, entirely built from the beams they salvaged after the demolition of the building that stood before at 44 Mercer, where now a new building designed by TRA stands. They are now starting a line of furniture utilizing the beams they collected from the different loft buildings they renovated. It is not surprising that they instinctively gravitated towards collecting the Venetian glass since the continuous reinvention of pragmatic, utilitarian objects, finds somewhat a parallel in their design philosophy. It is also a material that has to be worked with quickly, similarly to Bob Traboscia’s “minimal pour” pieces. The remix of contemporary, modernist and custom furniture, Venetian object collections, (Murano glass, Fortuny fabrics, vintage di Camerino accessories) and the exhibited art, are an example of TRA’s “curated interiors”, where the selection is very much about what is there as about what is not, in a editing process similar to the one of an artist that juxtaposes found objects. 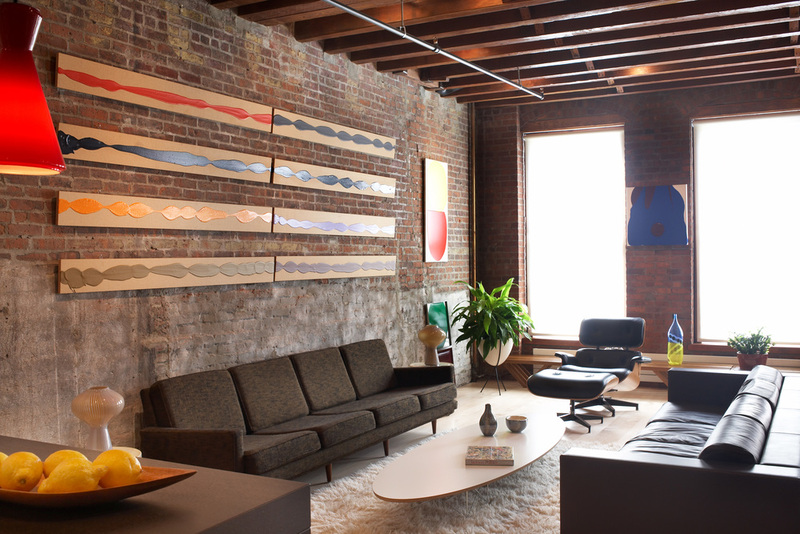 The comfortable aura, the luminous, enthusiastic, layered space, the certainty of the power of color and the “lightness of order” are typical of both of TRA’s interiors and of Robert Traboscia’s paintings, which are routinely exhibited as in a true artist’s loft, turning the art into the “view” of the interior spaces. Of course, the loft is a work in progress, stay tuned! “Roiatti highlights the connection betweenTRA Studio's design work and Traboscia's artwork, and explains that the aesthetic found in their projects is the same aesthetic found in the couple's own home. "We don't see the distinction between interior and exterior," Roiatti explains. "We think of each project as a whole."